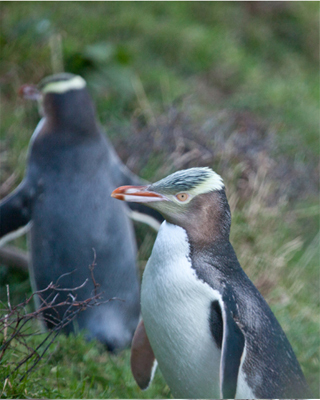 Pohatu is the largest Australasian Little Penguin colony on mainland New Zealand. 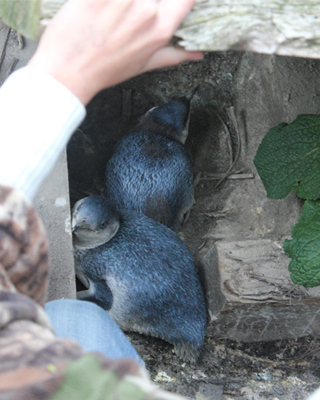 Francis and Shireen Helps have worked over the last three decades protecting White-flippered Penguins (Eudyptula minor albosignata), Canterbury's own variant of Australasian Little Penguin, from introduced predators. Because of the sensitive wildlife habitat only guided groups are taken into the breeding colony to view the White-flippered Penguins. 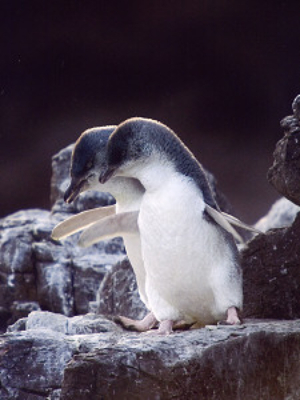 The best time for penguin viewing is the breeding season between end of August to December. You can see moulting penguins in January and February, but starting the end of February through early April we do NOT have penguins. There are also some windows of excellent viewing opportunities from mid April to September when the birds return periodically from sea. This is a wonderful option for people who wish to take part in our monitoring program and learn more, in depth, about our conservation efforts. This gives you great insight into the life of a penguin and an opportunity to see the birds up-close. 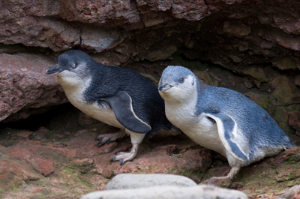 First, you will set off with a walk around the colony to monitor nesting sites and make sure that our Little Penguins are doing well. Then, you will have the opportunity to spot the penguins undisturbed from our hides , socializing on the water with our binoculars and our telescope and at dusk a very high likelihood of some returning to shore, we depart before it gets to dark and leave it for the penguins to do their thing without us in their way. Binoculars and camouflage gear is provided to maximize viewing abilities. We are not a Penguin parade and rely on natural viewing for this colony, (we don’t use lighting), we usually have a window of opportunity just before it gets too dark to view penguins coming ashore below our hides, but depending on Mother nature and how the penguins feel we can’t always guarantee they will come ashore before the cut off time we run the tours in. The hours of darkness are for penguins only as this is the time they have to walk home to feed their chicks. 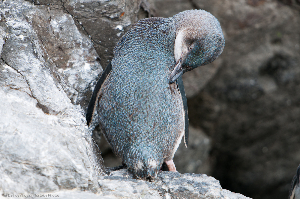 Saying that, it is still highly likely penguins come ashore below our hides on the rocks to preen before heading home. Monitoring nesting sites (opportunity to see penguins up close) and watching them socialize on the water with binoculars is our main focus. The Evening penguin tour departure changes due to lengthening or shortening days so please check on the day our current departure time.In summer it is advisable to either eat before you come on an evening tour or bring some food with you as often restaurants will be closed on our return to Akaroa. Over the winter months, booking available on enquiry only. This is because the penguins are not always there. Photography welcomed but strictly no use of flash. Good walking shoes or boots with good grip soles that can cope with a bit of mud in wet conditions. The track can be demanding for some and can be slippery in wet conditions. We do our best to have a well formed track in good condition as far as the viewing hides that most people can cope with. Bring warm clothing (some additional camouflage clothing will be provided). *Self-drive option is available. Please note that you must have a 4WD vehicle and are comfortable driving on narrow, steep, windy gravel roads in the dark. Self-drives may either meet us in the bay or follow one of our vans. Please indicate on our booking where you will meet us when driving yourself. Only in Akaroa for the day? 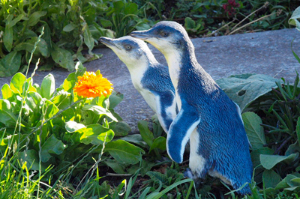 If you do not have the time to stay late or overnight in Akaroa, consider our Scenic Nature tours that would allow you to see penguins up close in nesting sites. 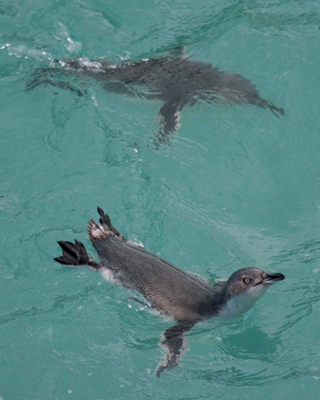 Experience a night right in the middle of the largest Australasian Little Penguin colony on mainland New Zealand! Our cosy units are available to enable you to spend more time at Pohatu Bay and free time to relax and explore Pohatu´s many secret places. The accommodation is located within easy walking distance of our beautiful safe sandy beach.